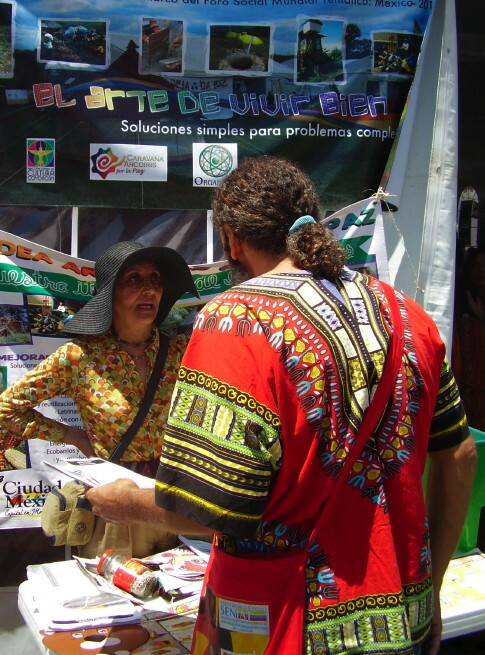 Contribution made at Foro Social Mundial Tematico at Zocalo in the historical centre of Mexico City, 3rd of May, 2010 as a panelist on the theme: Change the system, not the climate saving the planet and constructing another way of life for humanity. The text has been constructed afterwards based on the notes made for the speech with alterations and additions, especially of quotes from declarations made in Copenhagen and Cochabamba. There are three cardinal points for solving the climate change issue. The first is the balance between rural and urban class struggle. The second hope. The third is the work for constructing alternatives to the dominant development model in the countryside, in the city and in the world by safeguarding existing or creating new ways of living well. Climate change is a political question were the issue of social justice is central. Without social justice no long term solution can be found for the transition towards a sustainable society necessary for solving the climate dilemma. Thus both rural and urban class struggles are at the core of a solution to the problem. This social struggle is at times supplemented and even overshadowed by struggles that primarily are based on interests across class divisions as for transition to a carbon free economy, the nation state or the local community. Or struggles that are primarily focusing on ideological identities as reformism, degrowth, anti patriarchy, ecosocialism or revolutionary anti capitalism. Such ideologies are of importance to connect different local struggles. But in the end climate change is a material issue and thus class struggle with its immediate and situational conditions place a central role. Climate justice is about changing our relationship with nature. Thus at the forefront are the direct producers in agriculture, forestry and fisheries. But also the direct producers in industry have a key role as workers in societies processing of raw material and material goods. The importance of both rural and urban class struggles in important social issues and political struggles is not historically new. The first successful working class revolution started in Haiti 1791 among plantation slaves against the plantation owners who finally were thrown out of the country in 1804. The democratic and social progress during the 20th century built upon peasant revolutions in different parts of the world which paved the way for later industrial worker’s revolutions and reformist successes. This has not been properly recognized. The left is primarily building its theory on an understanding were the urban proletariat is in conflict with capital ands rural population are considered as marginal or backward. Thus is the Russian revolution in 1902 that inaugurated the revolutionary era a hundred years ago made invisible in the way that the left wing writes history, in spite of that this peasant revolution was contributing the critical mass the coming decades to change the system in Russia. The Mexican peasant revolution in 1910 and the Indian peasant revolution beginning in 1917 shows the importance of the peasants world wide in struggling for social change against the system. In Mexico we also see the differences between rural and urban class struggle were also left wing tendencies claiming to be more libertarian have shown its urban bias. In the 1910s the Mexican trade unions were among the strongest in all of Latin America if not the strongest. They worked in an Anarcho-syndicalist tradition in the Casa del Obrero Mundial preferring economic struggle and were critical towards political parties. Yet they quickly chose the side against agrarian revolution which they saw as an expression of backwardness and preferred seeing themselves as the civilized urban industrial vanguard. Furthermore they were promoted by constitutionalist forces who struggled against both the old conservative institutions which threatened to recreate the dictatorship and the peasant revolution. With a constitutional reform the syndicates would in the future be given a role at the negotiation table of society. Thus the Anarcho-syndicalist trade union used its red battalions in the civil war against the Zapatismo. Once the peasant revolution was defeated with the help of the red battalions the constitutionalist forces that had promoted the trade unions turned against them, disbanded the red battalions and forcibly closed the syndicates. So much for the liberal promises of having a say at the stake holders negotiations tables. The urban bias has been a problem in much of the struggle for social change the last one hundred years. Although anti colonialism and anti imperialism and the modern welfare state has been successes in many aspects the tendency is that the successes has been favouring the urban population more than the rural. Even when efforts are made to support production in rural areas the tendency has been to promote industrialisation of agriculture thus further moving power of the rural production out of the hands of rural communities to transnational companies and their offices in the cities or in the hands of state bureaucracies. 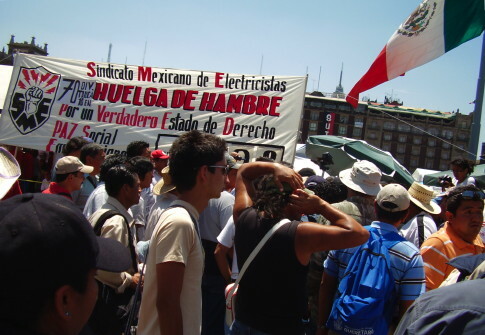 The main focus of the dominant struggles claimed to be left wing have also been either issues of redistribution of wealth or becoming a representative voice at different levels of governance as the Anarcho-syndicalists in Mexico hoped for in the 1910s. Recently this hope has especially developed around global institutions or renewed hopes for social partnership at the national or regional level, still a main strategy within the trade unions. The development model as such or the necessity of social revolutionary changes both rural and urban have been left out of focus. Thus the balance between rural and urban class struggles are important in all parts of the world as a key to understanding how to proceed in the struggle for climate justice. This is a balance that primarily is directed towards the need of the ongoing struggles and not any correct version of an ideology as when the Anarcho-syndicalists went to war against the Zapatistas in the 1910 as they were suspicious about the religious nature of the peasant revolution. It is also necessary to look more precisely at what political demands can specifically help the rural and urban class struggles built upon climate justice. There is a class struggle going on outside the context of climate justice but it is only by linking the demands to the climate issues the specific new possibilities for alliances can be built to further strengthen the direct producers in their struggle against owners of means of production. This means that in the case of peasants it is the struggle against agroindustry and its dependence on oil economy and the support of agriculture built on the photosynthesis in the hands of family farmers and small peasants or local communities that is a key to success when using the alliances on climate change issues rather than food sovereignty although the latter partly can be used as a model for building a sustainable agriculture. Likewise it is the struggle against the way that the industrial production is organized by the owners of the means of production making workers powerless and taking their creativity away by directing production towards fossil fuel based models and individual consumerist goods rather than goods of use for collective consumption. A political and economical struggle for other sustainable content of the production than that ordered by the owners of capital and their allies. Of importance are both rural and urban class struggles mobilizating in conflicts concerning both production and consumption and the way the society is organized. Struggles sometimes to defend positions already gained important for climate justice but under threat. Such as more equal distribution of wealth of importance for changing consumption patterns and challenging the power of the rich, occupying a wind power plant as on Isle of Wight in UK in an attempt to stop the closure, or struggling against mining and other exploitation threatening the life of rural working classes and local communities. Struggles were also solidarity action are of importance. The balance between rural and urban class struggle is not only a question for peasants and workers but also for others. Also wage earners in service and other occupations may have strong interest in the results of a united struggle against those in power of the means of production. At times such social forces that are not rural or urban direct producers may have a more consistent view on the need for changing society in ecological or feminist perspectives. In the climate justice issue such cross class alliance is soemtimes of crucial importance. The NGO policy industry working within the limitations of the system can at times find issues of wider importance. But there is a great risk that the issues are framed in a technical lobby language making them socially neutral. How the issues are connected to daily life and the daily class struggle is in this way made obscure. The tendency may instead become fragmentization of politics separating an international level or national policy area from politics of interest and possible to influence by lay persons in their daily struggle. There is also an academic industry promoting the self appraisal among NGOs proclaiming that the class struggle is dead and we instead have the almost limitless success of new forms of organizations, often stating environmental and development NGOs as the most advanced forms in modern politics. A global civil society replacing class struggles with NGOs focusing on well defined rational areas or ways of ways of working. Or identity politics instead of struggles in solidarity for material interests were the important matter is to have your voice heard and not so much changes in material relationships between human beings or between human beings and the rest of nature. Contrary to this view on politics the rural class struggle have been central to the emergence of the anti-globalization movement and the democratization of global popular movements allied to each other. The most decisive political actor that has united and radicalized the climate justice movement is the peasant movement Via Campesina. This influence has been strongly felt in global politics since the creation of People’s Global Action (PGA) in Geneva in 1998 and the successful anti privatization struggles in Cochabamba ten years ago were also a PGA meeting was held in 2001. 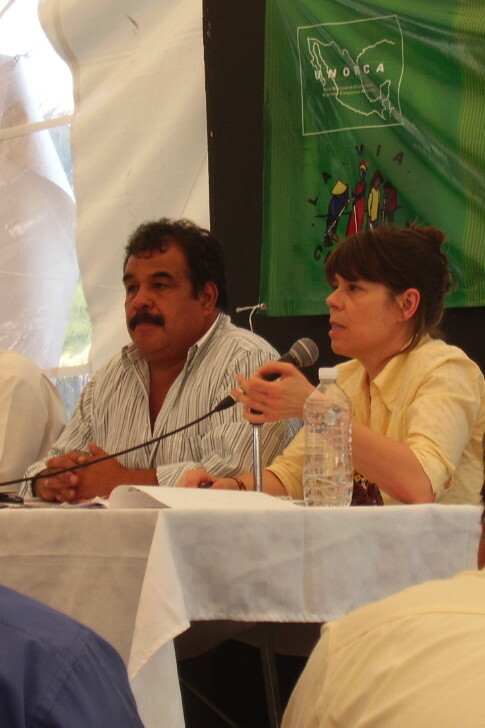 Together with the mainly rural indigenous movements and the Zapatistas Via Campesina has been able to challenge the mainly urban NGO lobby industry. Especially successful since the creation of an alternative to the policy and lobby oriented Climate Action Network by the more political and popular movement oriented Climate Justice Now in 2007. This became clearly evident during the combination of mass activities during the climate summit in Copenhagen 2009. Here Via Campesina was the key mass movement that supported the Reclaim power direct action at the Bella Center fomenting the alliances between the different forms of struggle with the same political message – System change not climate change. The Peoples Agreement issued at the Cochabamba meeting takes a step further in both criticising capitalism and promoting indigenous perspectives. But it is less clear about class struggle and which is the actor that can contribute to social revolutionary change. The primary actor in the agreement is a ”we” and capitalism as a system should be confronted to a large extent by demanding rights. Thus when it comes to class struggle and recognizing contradictions the Peoples Agreement from Cochabamba is a step backward. 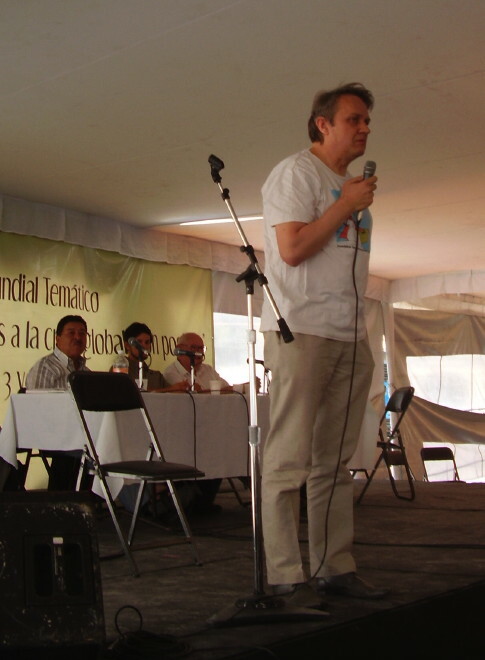 The statement issued by the excluded working group 18 (Mesa 18) in Cochabamba have a message more similar to the Klimaforum declaration both in terms of its focus on community approach and social struggles: ”New Model of Managing Natural Resources to counter the capitalist production model still prevalent in Latin America. which is situated in industrial development and the consolidation of transnationals, funded in private property, individual gain and consumerism, aspects which have been put to judgement by the nations and the people of Latin America. The development plans of these governments, including the Bolivian government, only reproduce the development model of the past. To challenge climate change humanity needs to remember its cultural collective communitarian roots – this means building a society based on collective property and in the communal and rational management of natural resources, where the peoples decide in a direct way the destiny of natural wealth in accordance with their organising structures, their self determination, their norms and procedures and their vision of how to manage their territories. History teaches us that there is only one effective way to transform society and to construct a social alternative to capitalism, that is the permanent mobilisation and articulation of our struggles. So the Klimaforum declaration and the Mesa 18 declaration Cochabamba is a more important base for maintaining the understanding of a balance between rural and urban class struggle than the Peoples Agreement from Cochabamba. Making the balance of rural and urban class struggles is essential in the cooperation ahead which today means primarily to raise the awareness and solidarity with the class struggle of the peasants world wide, a task one can hope becomes central in the Mexican and international mobilization towards Cancun and COP16. Hope is essential to us all. The hope that grows in our hearts when we struggle collectively without illusions and with love. With that almost all is said. I just want to add to the commemoration of the murdered activists Beatriz Carino and Jyri Jaakola killed a week ago in Oaxaca while defending an autonomous commune. As Jyri came from Finland I would like to honour him with a song from Finland. It comes from the Åland island which is a Swedish speaking part of the country. It has a content and a melody quite different from the way Beatriz was celebrated yesterday here at Forum Social Mundial with a standing applause. In the Nordic countries commemoration is rather made by calling for a minute of silence and our traditional songs are rather melancholic than moving hearts by clapping hands. I will sing the song first in Swedish and then explain it in Spanish. Quien puede navegar sin velas? Quien puede remar sin remos? Without just one tear to pour? How is it possible to combine hope and struggle? The key to this combination is a constructive program. Here Klimaforum09 is an example of how it is possible for small groups to do the impossible by focusing beyond demands in reaction to the official UN agenda. On the one hand by making alliances with the international popular movements built on democratic principles having a leadership that is representing the global majority and thus with strong third world influence to have a stable ground for rejecting the false solutions promoted inside the negotiations. On the other side primarily focusing on alternatives. How is this than possible? International politics is both at the governmental and the so called civil society level dominated by the agenda set by governments. Highly specialized NGOs have emerged with professionals following these negotiations and scrutinizing the content. This is a necessary work to be able to understand and defend important political demands. But it is also important to win the hearts of people and make politics understandable to have a constructive program that shows ways to solve the social and ecological problem at hand. This struggle for a constructive program is less of interest to main stream NGOs getting their legitimacy from contributing constructively within the frame work of the system to negotiations and public debate. At least if the constructive program concern conflicts and is not primarily ideas about how market mechanisms or technical improvements can solve the climate crisis or changes in individual moral or ideology. In Denmark ahead of COP15 the problems was aggravated as main stream organizations were about thousand times bigger in membership than organizations promoting system critical constructive programs. With lack of economic resources and professional staff the system critical organizations seemed helpless compared to the huge organizations as the Danish Conservation Society with 140 000 members in a country with 5 million inhabitants. Initiated by an international permaculture meeting in Brazil 2007 small Danish ecological organizations and soon also a small member organization of Via Campesina, an organization with fisherfolks and Attac started to prepare a proposal for a counter summit during COP15. As they all were small lacking resources they approached the big main stream NGOs for cooperation to be able to host the tens of thousands of expected visitors to the Climate Summit in Copenhagen and the many alternative activities. But the main stream NGOs refused as they saw no purpose in organizing such an peoples event. They had all the access to the politicians they wanted as they had gained accreditation to the official conference venue and was in no need of any other activity to reach their goal embedded as they are in the language and procedures of the official negotiations. Thus the small organizations were left with no other choice than to go on by themselves and so they did. They applied for support from the right wing government that was faced by a severe problem of legitimacy as they more than the main stream NGOs knew that for the legitimacy of international negotiations to close the possibility for alternative independent voices to be heard is against international standards. The government did what they could to both give money for a civil society forum but hand the power of the money over to NGOs and the small organizations leaving to others to decide. This caused furious conflict between the big NGOs who now when there was money were eager to get control of the proposal for a Klimaforum and the small organizations that refused to back on their original plan for a Klimaforum based on refusal of false solutions against the interests of many main stream NGOs eager to present themselves as responsible and supporters of such things as carbon trading. The small organizations did not give in and thus Klimaforum could finally be established against the interest of both the Danish government and the main stream NGOs. It was also partly against the interest of the well established network for popular movements and NGOs for Climate Justice policy making during the climate negotiations, CJN and of course against the interest of Climate Action Network, CAN that more firmly is adopted to the rules of the lobby system. The relationship between established international representative levels of organizations and the local and national level during such occasions as a summit is always problematic. The cooperation between different organizations internationally is already a delicate matter. Adding to that the specific circumstances in which every political culture acts and reacts to political initiatives makes the situation even more complicated. Not so much for specialized NGOs that can work far above local realities but certainly for popular movements with popular participation as their main force. This main force is primarily possible to mobilize inside the country were the summit takes place. It cannot with any sustained result be imported from other countries. Thus there was a conflict between the Danish organizations and the established CJN network. The Danes wanting to built a broad alliance for climate justice focusing not only on demands towards the UN summit but mainly on alternatives and a sustainable transition while CJN saw a problem in yet one more statement and how problematic it is to get many organizations united. Against the will of the Danes to make a declaration at the Klimaforum CJN organizations noted that it took one year to come to consensus on three bullet points in their common CJN agenda. But the Danes had already received good support for their declaration process especially from the third world and wanted to go along anyway, a difference of opinion that was finally solved by building on the positions of CJN in the part addressing the UN negotiations while going deeper into the issues of how a social change and a constructive program for agriculture, forestry, town planning, energy, transport and industry can be constructed. This was well received by 500 organizations world wide signing on to the declaration that gave a lot more political coherence to both the Klimaforum activities with 50 0000 participants and the political linkage of the system change not climate change bloc in the main demonstration 12´th of December and the Reclaim power action on 16th of December. There were differences in the views on what forms to chose for the struggle but not much concerning the content of the different climate justice mass activities in Copenhagen. Thus Klimaforum09 was a breakthrough for going beyond a UN agenda addressing the need for social revolutionary constructive programs for rural, urban and industrial reforms. The Peoples agreement from Cochabamba was in this aspect a step backward as the main focus here was on demands in relationship to the UN negotiations or demanding a set of rights. Here again the working group 18 had more the same kind of focus as Kliamforum09. Every movement needs to be able to defend itself, to mobilize enough resources for its actions and a critical mass that can make a difference. The Cochabamba meeting had these qualities. In spite of the limitations of the UN system it is also the result of earlier social struggles manifested by the victory over Nazi Germany in the World War II and the declaration of indivisible social and democratic human rights. With all their limitations such rights have been important to defend people and overcome oppression at times. UN has also sometimes played a progressive role in the struggle against colonialism and imperialism and at least in earlier days on environmental issues as sulphur dioxide emissions. Contrary to many other global institutions as WTO, IMF or groupings as G8 or G20, UN is an institution that is not completely an expression of the will of the rich and powerful nations but poses a possibility for defending important principles in international affairs. But this possibility depends on the strength of popular movements and their influence on governments which in general at the present moment is weak in many countries. The Cochabamba meeting can be seen as an expression of challenging the super powers and the rich nations within the system in a way that creates important venues for differences among the elite which again can open up for new more offensive possibilities. Thus focusing alone on well formulated demands in relationship to the UN climate negotiation agenda is far from enough. It is necessary to build further on both a more conflict oriented social struggles agenda and a broad based social revolutionary constructive program for land, urban and industrial reform. We need a transition of agriculture from fossil fuel based to photosynthesis based in the hands of direct producers, We need planting of nutritious native trees for local community needs, we need building and rebuilding of housing and other buildings including the energy and transport systems based on social needs and organized by commons or public efforts against the interest of privatizations of all services, we need town planning against the occupation of public space by consumerist propaganda and cars. In Copenhagen 40 percent of the population use bicycles for their daily transport and it is now discussed how to create waves on the bike paths to avoid the rush hour queuing at red traffic signal and instead make the cars wait. The construction workers in Denmark propose a program for rebuilding houses making them climate friendly and the Danish peasant organization member of Via Campesina promotes a land reform. In Malmö next to Copenhagen in Sweden young activist in the Reclaim the fields movement started by Via Campesina grow food for the activists that came to COP15 and served for free. Now they are building a urban farming movement to strengthen local communities. In the Cancun region local ecological groups in an area with very little social cohesion and heavy under pressure from tourism exploitation are trying to create solidarity economy and ecological alternatives to the dominant development model. All over the world constructive alternatives are possible to win and to struggle for and unite beyond alliances for demands towards international negotiations. Thus one can hope that a combination of the Klimaforum declaration from Copenhagen and both the Peoples Agreement and Mesa 18 declarations from Cochabamba can inspire the Mexican initiatives towards Cancun and the international mobilization to bring us steps beyond the official UN agenda towards more of social struggle and a constructive program to solve the climate problem in a way that also can solve other social and ecological problems.